For your information and convenience, we have compiled a list of most frequently asked (general) questions by many of our clients. For more specific, product related FAQs please refer to our menu on right or these can be found within their product categories as well, where applicable. Ability has an agent in every state of Australia. Please view our ‘Where to Buy’ section within our website for further details. Please note that not all agents carry our full range of products and that our head office is located in Melbourne. 133 - 135 Northern Road, West Heidelberg, Victoria 3081, other Suppliers can be viewed on this site at the Where to buy section. From our Melbourne Warehouse, upon receiving an order before 10 am on a working day, we can have the product sent to Sydney by two working days. 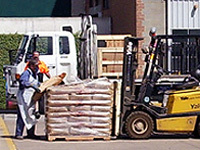 Other locations around Australia can take up to five working days depending on the distance and the quantities ordered. Smaller samples in the post can be received within two working days or, by agreement, can be sent by overnight post for the next working day and in some cases, postage and handling expenses may be charged. Within our website you may view on line samples of our abilox® Colour Specifier colour range (please note that colours are only approximate) and hard copies of our Colour Specifier can be ordered via email or over the phone from within our ‘Contact us’ page. As each product and quantities vary, we advise you to check the Product data Sheets (PDS) for each specific Ability product found within each product section within this website. Please click on our abilox® how to estimate quantities pdf for a simplified calculation. This ‘white salt’ effect is known as efflorescence. Ability has a product which is unique in the market place called Efflorein® Mark 2 which when mixed with the concrete before it is poured eliminates this problem. Unfortunately after the concrete is set this streaking is very difficult to eradicate so we recommend an application of colour matched duro paint™ with it’s 20 year guarantee* (*conditions apply) as it has the durability and qualities required for a heavy duty areas such as concrete pavements - particularly driveways.